A relatively new band to the scene, Mercy Isle first made themselves known via the ‘I’m Gonna Make It’ single which appeared in March 2015. Since then the band, fronted by Kassandra Novell, have issued a four-track EP, and last October – about two years after the band came together – saw the release of ‘Undying Fire’, their first full album. The ‘Storm’ EP followed in October 2015, and featured three new songs (‘No One Will Save You’, ‘Uncaged’ and the title track) as well as new version of ‘I’m Gonna Make It’. “It all came together very smoothly. At that time, our former guitarist Cory Scheider was also launching his own recording studio, so he recorded all the guitars and Chad’s bass. Jeff Shaffer, a friend of our former drummer Adam Maltby recorded his drums. Then Chad and I went to Akamaradara Studio in Minneapolis, Minnesota, to record our vocals with Voa VoXyD. He’s the one who also mixed our raw tracks. Then he handed the final mixes to Ronin Chris Murphy at Veneto West Studios to master the EP. 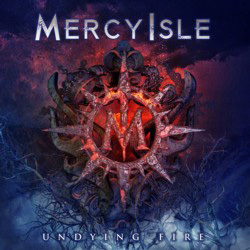 A year later came ‘Undying Fire’, the title of which came from the lyrics of the song ‘If I Could’. “But beyond those lyrics, it also has a deeper meaning for us,” adds the singer. “We saw a band line-up change, with the departure of Cory and Adam right in the middle of pre-production, and with a very tight schedule for releasing the album we certainly had obstacles which made the situation seem impossible and which could have easily deterred a lot of bands. But we have this special kind of ‘undying fire’ in our souls, and with help from fellow musicians and the determination to support each other as bandmates, we pulled through. So, the title is also a reflection of our experience of recording the album. Despite the fact that ‘Undying Fire’ features the three new cuts from ‘Storm’ in re-recorded format, it still sounds fresh and vibrant. “One of our goals with the album was to provide variety and changing atmospheres. We didn’t want our music to develop the disease of ‘same-songitis’, where the tracks start to blend together and they all begin to sound so similar it becomes boring. Thankfully, I think that was achieved. From many of the reviews we have received, one of the recurring compliments has been that there’s a little something fresh and different in each of the songs, and some people aren’t exactly sure how to classify our music because we’ve incorporated different influences in each song.